T.S. Eliot famously wrote that April is the cruelest month. Birth, rebirth, life, death. You tend to contemplate the grand themes around this time. 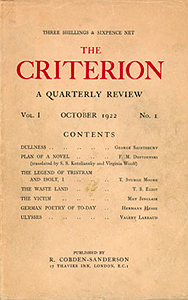 It is hard not to do so at the New York Antiquarian Book Fair when you see that Biblioctopus is offering the true first of The Waste Land in the October 1922 printing from The Criterion, edited and published by Eliot himself ($4750). So it was not that big a stretch to contemplate the life and death of the rare book industry as I walked through the Armory at 67th and Park. I went to the Fair on Friday April 3rd (a special thanks to Stephen J. Gertz). It was a rainy, blustery day, and I could not help but think of Bob Dylan’s “Blowin’ in the Wind.” All parties agree that in the rare book world, the times they are a-changin’. It is definitely a period of uncertainty and transition. Discussion of “this economy” was front and center at the fair (even in more stable time it is April after all and tax day gets everybody focused on their finances), but to me the current economic crisis is not the most interesting or most important force rocking the rare book boat. That would be the Internet and the electronic media revolution. Although they are interdependent and related, the recession seems to me to take a backseat to the much ballyhooed media crisis concerning the death of the newspaper, of print, of the book, and of corporate and academic publishing. In addition, the continued reliance on the digital and electronic as the means for the storage and production of information threatens to erode the very foundations of the rare book market. Interestingly the highlights of this particular Lame Duck catalog are a strong run of Jorge Luis Borges manuscripts, including holograph versions of “The Library of Babel” ($500,000) and “Pierre Menard, author of Don Quixote” ($450,000). The issues raised in the Lame Duck introduction seem particularly Borgesian. As Lame Duck suggests, high-quality material may always be available. At this year’s fair, Lame Duck proved this was indeed the case. For me and my interests, Lame Duck had the single most incredible item at the entire fair: a presentation copy of Semina Two from Jack Kerouac’s personal library and inscribed by Wallace Berman “Michael McClure mentioned you would probably dig this” ($17,500). In fact, Lame Duck had several books from Kerouac’s shelves including a remarkable copy of Zen for the West by Sohaku Ogata. On the endpapers Kerouac wrote four manuscript haiku, the first being “Haiku for Creeley” ($15,000). Also available was Kerouac’s personal copy of the French edition of On the Road ($20,000). Contact Lame Duck for a possible upcoming catalog detailing all the Kerouac titles. Lame Duck did not have any Burroughs titles from Kerouac’s library nor were they aware of any, but they had word on one of the more interesting Burroughs items I have heard of in a while. A seller in Mexico contacted them about the manuscript of a Burroughs story about Bernabé Jurado, his Mexican lawyer during the William Tell affair. Lame Duck was unable to place the manuscript with a buyer, but they can stand by its existence. Clearly exciting new material, including the jaw-dropping letter, is still coming to light. Case in point was a remarkable two-page letter from Thomas Pynchon to fellow writers and Cornell grads David Shetzline and M.F. Beal ($25,000). Seller Ken Lopez allowed me to read the entire letter, which was written in pen on graph paper. It was remarkable. Funny, hip, and well, Pynchonesque to the extreme, a thoroughly entertaining document that gives a tantalizing glimpse into Pynchon as a person and a writer. But the central question Lame Duck asks remains: is the current generation of writers still generating this type of material? Don’t forget that certain techno-pundits predict the death of printed books, not just handwritten letters and manuscripts. What will rare book dealers sell in the future? We have touched on these issues in an interview with Brian Cassidy. For the time being let’s assume that the pool of collectible rare books and ephemera is, like many assume our energy resources to be, a bottomless well. Who is going to buy it? Possibly more pressing than the death of the book is the death of the collector. Walking through the Armory I was struck, as I have been for the past 15 years, at how few collectors are in my age bracket. I am 38 years old, and I am still a whippersnapper in the rare book world. As a serious collector in my 20s I was as rare as a Digit Junkie. Pushing my 40s I am still an anomaly. 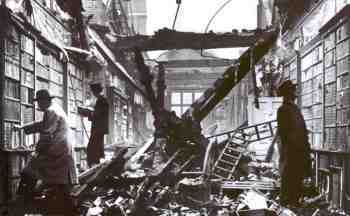 Quite simply, book collectors are threatened with extinction. What are book dealers doing to stimulate interest in the young? Ian Kahn at Lex Mentis has sponsored book-collecting awards at the collegiate level. Contests of this type are pivotal in developing fresh talent into the rare book world. William Reese won such a contest at Yale decades ago. He was once the young gun of the rare book world. Now he is an elder statesman. Booth to booth in New York City, the book dealers under 40 were far and few between. Thankfully I find the younger ones, such as Brian Cassidy, Jeff Maser and Jon Beacham, to be some of the most exciting forces in the industry for my personal tastes, so there may be hope for the future. The development of a new generation of book dealers should be an ABAA priority. It may behoove dealers to cultivate young collectors as well. What are these young collectors going to buy? Years ago I read an article stating that a high percentage of the rare book market is comprised of books one had read by the age of 15. That clearly explains the robust market for children’s books, comic books, science fiction, and fantasy. It also explains the explosion in value of a host of post-WWII classics like To Kill A Mockingbird, Catcher in the Rye, On the Road, Catch-22 and One Flew Over the Cuckoo’s Nest. Among young collectors are graphic novels and original artwork being collected? Will children’s books such as Harry Potter maintain their status as high-end collectibles that increase in value 70 years after publication (like Tolkien’s The Hobbit) or close to 150 years later (like Carroll’s Alice in Wonderland)? Or will they eventually decline in price like other children’s stories that captured a fickle imagination for a season or two, crested, and then slipped back into the vast sea of other bygone classics? I don’t know. One thing seems certain to me — that with the decline in attention spans and the appreciation of basic tenets of literature (such as the traditional novel’s embrace of narrative, plot, and continuity, in fact all the trapping Naked Lunch abandoned), the next generation of collectors are going to shy away from the age-old foundations of the rare book industry. The novel as practiced by the Victorians and challenged by the Modernists will no longer be collected with such fervor. In fact the “death of the novel” seems very possible on a collecting level. I would also expect the experimental modes in 20th Century poetry, like Pound – Williams – Olson, to continue to gain ground with a decline in the Eliot – Stevens – Lowell line. Maybe these predictions are my personal preferences talking. In a similar development, the standardized presentation of text will continue to decline in importance and the book as an art object will continue to take center stage. Typographic experiment and challenges to the concept of the book will continue their rise in popularity. The shift to the visual is already underway and probably has been for years. My untrained eye notices far more photography, design and architecture, and artist-book / art-book dealers at shows like the one in New York. This will only increase as younger generations are continually saturated with images in the form of the Internet, video games, rapidly edited film / tv, and other visual media. This is definitely true for me. 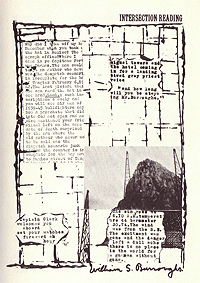 The text of Naked Lunch and my appreciation for Burroughs as a novelist got me started as a collector, but increasingly I became obsessed with Burroughs as a visual artist — not Burroughs’ paintings but his scrapbooks, cut-up experiments, text-and-image experiments as described in Ports of Entry. I am also becoming increasingly interested in typography and developments in book art, history and design. 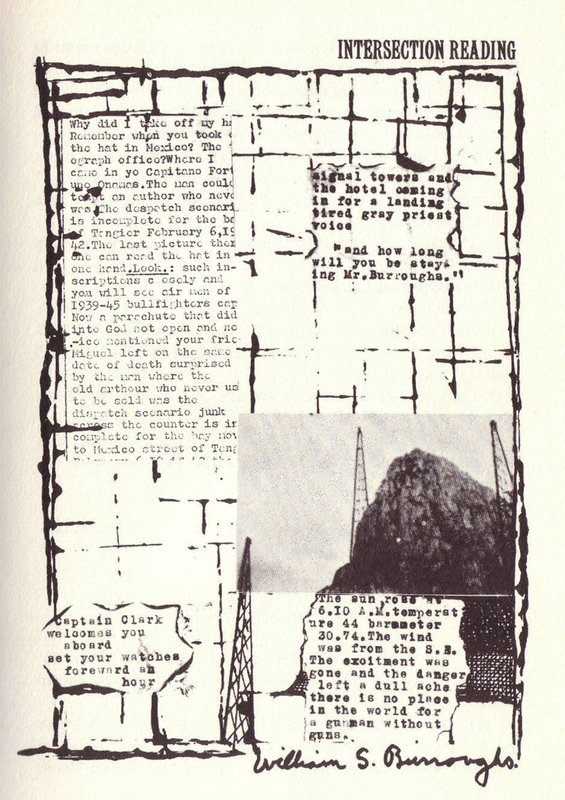 Luckily with Burroughs all these interests merge in the form of his little mag, small press and mimeo publications. The products of the Mimeo Revolution seem poised for an explosion. The continued rise of desktop publishing, blogging and DIY media coupled with the death of traditional print culture means that the pioneers of mimeo and small-press publication will be fetishized as never before. Mimeo is one of the birthplaces of all DIY media and the epitome of the fragility and ephemeral nature of print. In addition mimeo possesses a very distinct sense of design that has proven very influential in the media of the new millennium. It is no coincidence that giants of mimeo design, such as Wallace Berman and Joe Brainard, are experiencing increased attention in the last five years (see Semina Culture and The Nancy Book for two examples). One of the highlights of the New York show was a Joe Brainard drawing offered by Alan Zipkin at Derringer Books. The drawing was a prospective cover for a C Press publication that was never realized. The drawing comes with a manila folder inscribed by Brainard providing some scant details on the aborted project ($5000). Similarly, Ian Kahn at Lex Mentis is very aware of the value (financial and cultural) of mimeo and counterculture printing. At New York he had an archive of Communications Company screeds and related ephemera. The Communications Company was the printer for the Diggers, the San Francisco Mime Troupe, and the Haight-Ashbury community generally. Kahn was quick to point out that founders Chester Anderson and Claude Hayward were in a sense the first bloggers. Not surprisingly, Kahn also specializes in artist’s books. Like the artist’s book, mimeo complicates the dynamics of print and the book, not just on the level of production, but also at the level of reception and distribution. Jon Beacham of Hermitage as a printer and a bookseller is also aware of rising interest in the mimeo revolution. Overlapping with the New York Fair, Beacham showcased an exhibition of the work of the Zephyrus Image (Holbrook Teter and Michael Myers) pioneers, like The Communications Company, in the DIY aesthetic in San Francisco. Kahn and Beacham are two book dealers that think outside the box in how they do business. I have mentioned Kahn’s efforts to stimulate the future of book collecting in this piece, and I have written on Beacham’s business model before. Yet the New York show proved to me that the future of the rare book industry is not all about progressive thinking. That age-old staple of the rare book trade, the catalog, is back with a vengeance. I have written about the return of the catalog elsewhere but talking with dealers at the New York show suggests the truth of those pieces. Recently Ken Lopez and Between the Covers jointly issued a major catalog of highspots from the collection of Bruce Kahn, a collector from Michigan who bought heavily from them. Kahn’s interests in post-WWII literature were far-ranging, including a world-class collection of Jim Harrison that is forming the basis for a bibliography and other research, but the constant in his acquisitions was a no-nonsense, no-compromise attitude towards condition. Quite simply Kahn wanted to possess the best copies in the world, and he was persistent and unwavering in that pursuit. In many cases his copies are close to flawless. Again and again the descriptions in the catalog make his obsession with condition clear. You name the post-WWII highspot and Kahn had it in the finest possible state. I have to admit that I flipped through the catalog with some skepticism. In this economy, who in their right mind would pay ahead-of-the-curve prices for seemingly everyday titles like Catcher in the Rye and On the Road? Apparently lots of people, since the catalog sold very well, in fact surprising Lopez and Congalton in the process. I don’t know what to make of this development. It flies right in the face of what I feel is exciting in the future of collecting: experimental literature and a broad conception of the Mimeo Revolution. Maybe I am allowing my personal preferences to cloud my judgment. Or maybe not. Given the age of the book collectors I saw at the New York show, it could be that the success of this catalog could be the beginning of the end for the aging, baby-boom collector. The catalog gave off the sense of culmination and completion, not beginnings. Perhaps collectors were adding crown jewels to their established collections, rather than laying foundations. Clearly, with the prices in this catalog, only the established and wealthy could purchase the books. But are the rich and famous of the under-forty set are buying these traditional highspots? The attendees at the book fair suggest not. What the Kahn collection does make clear is that there is one thing in the collecting world that will never change: the unparalleled importance of condition. What made the Kahn catalog such a hit was the one-of-a-kind condition of its listed books, which are far from common in this condition. In fact, they are unique. There will always be a market for the world’s finest example of anything, even if that item might be out of favor or fashion. Whomever the buyers of rare books may be, they are increasingly not doing it on the internet. According to conversations I have had, internet sales are stagnating. I hear this across the board. It is already common knowledge that big-ticket items do not sell online, and it appears that the lesser priced collectibles are not finding buyers either. This may not be true for run-of-the-mill used books and hard-to-find academic titles, but for true collectibles where condition and provenance are paramount, the internet is slowing down. Reputation is king, and more and more collectors are waiting to buy from catalogs compiled by dealers they know and trust. This is definitely true for me. I have had enough of slow mailing, insufficient packaging, and poor conceptions of what is acceptable in condition. I find myself returning to the same handful of dealers. Others are doing the same. If Lopez and Congalton state that a copy of On the Road is “perhaps the nicest copy of this postwar classic we have ever seen,” that speaks volumes when compared to joeblow.com’s assurance that his copy is fine, i.e. has clean pages, isn’t musty and was stored in a smoke-free room. Clearly others agree. The recent Royal Books catalog was a success with sales coming in quickly. The latest Beatbooks catalog performed very well. Every item in which I expressed an interest sold within two days of the issuance of the catalog. Burroughs material outside of the basic A items did particularly well. The New York show hammered home just how subjective a thing condition can be and thus how important dealers with experience are. There were a handful of copies of Burroughs’ Olympia Press titles available and most were described as fine. There was even a “flawless” set. I have seen tons of copies of these books over the years and it is very informative to me to see what “flawless” copies of those titles look like. 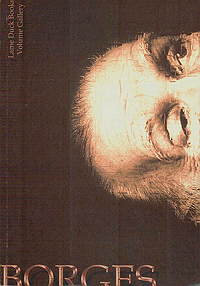 As you expect, they are not flawless, no book is (we are touching on Borges again here as well as Benjamin, Blanchot, and other philosophers of the book), but it is interesting to see the levels of fading, creasing, and other blemishes that are still acceptable under a label of flawless or fine. The better the dealer the more stringent the grading of condition. What the New York show make perfectly clear is that high quality copies of Burroughs’ Olympia titles are few and far between (particularly for The Soft Machine). As I have been saying since the beginnings of the Bunker, if you can afford it do not skimp on the Olympia Press titles. A truly fine copy of any of those books is worth the extra money. The impressive performance of the Kahn collection proves this to be true. The New York Show brought home to me a vicious circle of the rare book industry. In these troubled times, experienced bookmen are needed and relied upon more than ever. These bookmen, like the collectors, are rapidly increasing in age. The economics of the book trade coupled with younger generations’ increasing disinterest in traditional print culture makes replenishing the pool of both dealers and collectors difficult and slow to develop. I have been reading essays on the rare book trade recently and it seems to me that none of these developments is anything new. People have been bemoaning the decline of the bookman and the aging of all involved for decades if not centuries. Maybe this is just an example of the obsessive nature of bibliomania shading into paranoia, but as Burroughs said, being paranoid is having all the facts. The fact is the current rare book market is in flux on several levels. Everybody knows that April showers brings May flowers but nobody at the New York Fair knew what to expect in the future. The atmosphere had elements of a Beckett play: I can’t go on; I’ll go on. Yet as with every New York Fair for the last 15 years, the books were incredible and there is no finer show in the United States. I got pleasure seeing some old faces and happily I met some new ones. I had a great time and will be back next year. The New York Fair is a hearty perennial and there is a comfort and beauty in that. Written by Jed Birmingham and published by RealityStudio on 13 April 2009. See also Jan Herman’s story about a visit with dealer Ken Lopez and a video of the books Lopez was offering at the fair. Jed, how much would it be possible to get a decent-quality Olympia Press Naked Lunch for, with dust jacket? And would you advise avoiding the net for buying it, ie Ebay? As unexciting as it may be for a real collector, I was very excited to get a 2nd Edition Grove Press 1966 Soft Machine hardcover the other day for $15. It is near mint and I have no idea what it’s actually worth – I can only assume less than $15 – but it’s cool to have the hardcover nonetheless. I have always preferred hardcovers.